This dish is the perfect, warming supper sure to satisfy. Add frozen Tenderstem® for the ultimate convenient veggie to brighten up this Asian spicy soup. Spray a deep frying pan or thick bottomed saucepan with cooking spray and add the diced shallots. Fry until they soften and brown. Add the Thai red curry paste to the shallots, allowing the paste to cook for a couple of minutes. Add the red peppers and red chilli with two tablespoons of the coconut milk and continue to cook until the peppers begin to soften. Add the rest of the coconut milk with the vegetable stock, lime juice and lime zest. Bring to a simmer and then reduce the heat and cover. Cook for 20 minutes. Meanwhile, in a separate griddle pan, fry the prawns with the garlic and some cooking spray. Set aside once cooked, and save the pan to cook the frozen Tenderstem® broccoli. 5-7 minutes before you're due to remove your soup from the heat, put the griddle pan back on a medium-high heat. 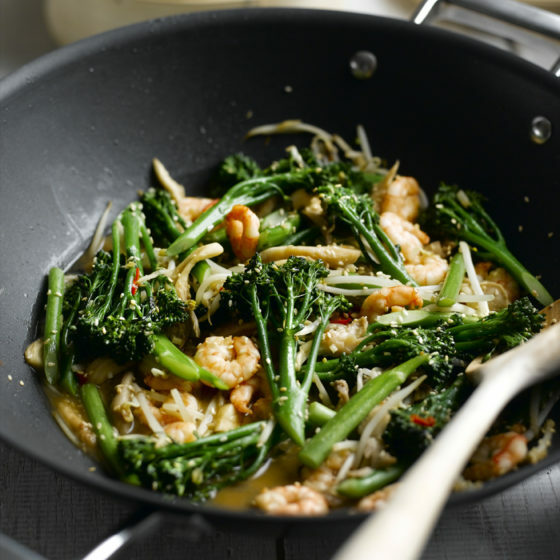 Spray the pan with some cooking spray and add your frozen Tenderstem® broccoli. Season with salt & pepper and turn after a couple of minutes. Remove from the heat when cooked on both sides. To assemble your laksa, divide the noodles between four bowls and add the spicy soup and peppers into each until the noodles are almost covered. Top with your grilled prawns and grilled Tenderstem® broccoli and drizzle with some more of the laksa soup. Garnish with a slice of lime, some sliced chilli and a sprinkle of coriander.